The folk scene is alive and well and living in Rainford. 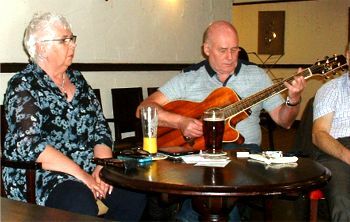 The Wooden Horse Folk Club has a long << history >> and has been a magnet for musicians, singers and enthusiasts drawn from a wide area of south west Lancashire, Merseyside and western Greater Manchester. We've been through several incarnations and met up at various venues over the years but thanks to the dedicated efforts of our organisers, Jim and Pauline and the support of a band of loyal members and residents the club has survived and indeed thrived. We've recently settled into our new home, actually our old home of a few years ago, and it feels like we've never been away. 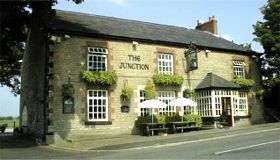 'The Junction' at Rainford is the perfect venue for us since Paul, our landlord, has created a Mecca for musicians and lovers of live music across a wide range of genres. We meet up (almost) every Sunday evening in the function room above the bar and our singers nights are interspersed with regular guest appearances from nationally renowned guest artistes. 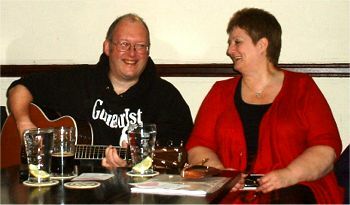 The singers nights are very informal and we welcome singers / musicians / poets of all abilities to join us. But you don't need to be a performer to be welcome at the Wooden Horse. What's the point of performing if you don't have an audience? Music is not the only pleasure available at the Junction, there are a wide range of excellent dishes available at very reasonable prices. There are even 'half portions' available for those of us weight watching. Food is served from 12 noon to 8 pm. Of course, where would folkies be without a good selection of real ales on tap including a couple from our local award winning micro-brewery, George Wright Brewing Co., who even brew 'Up the Junction', a 3.9% A.B.V. bitter, specially for us.